CLAIM TO FAME: Helping to create "Area BFE," a private playground for "extreme" off-roaders, mountain bikers and climbers. HE SAYS: "Public lands around here are getting pretty bombarded with use — why not bring it to a private place?" Standing at the edge of a sandstone cliff in southeastern Utah, Jeremy Parriott looks out over the hilly desert land that he owns with several partners. Nearby, a couple of dirt parking lots have been bulldozed into the piñons and junipers, and a four-wheel-drive trail twists through rocky outcroppings. Parriott and his partners have a vision for this place: an extreme-sports paradise, where people can four-wheel, mountain bike and rock climb without the restrictions found on Utah’s public lands. A few years ago, when he first started looking at desert land, Parriott thought about building a big skateboard park. But he soon decided that creating trails for four-wheelers would cost a lot less — and it would help take some of the pressure off public lands, which are getting hammered by off-road drivers (HCN, 5/30/05: Moab: On the horns of a recreation dilemma). On their 320-acre spread 12 miles south of Moab, which he and his cohorts call Area BFE, they’ve carved out some steep, challenging routes for burly, big-tired rock crawlers. "If they can do really extreme stuff at our place," he says, "hopefully, they’ll stay on trails on public lands." Unlike many of his four-wheeling brethren, Parriott also thinks the Bureau of Land Management should close some public trails to motorized use: "Hikers deserve a place where they can go and not hear motors." Parriott, whose great-grandparents were early Moab settlers, says he’s always had an "explorer attitude." That attitude landed him in Iraq during the first Persian Gulf war, serving with the Navy. After returning to Moab in 1997, he ran a skateboard shop, raced motorcycles, and did movie stunts, then guided for a German adventure company. Guiding, he says, taught him that sports help bring out the best in people, and that "all people have the same basic nature." Now he makes a living by producing videos about extreme sports (mostly four-wheeling and rock-crawling) and by developing advertising for outdoor recreation clients. So far, Area BFE is mostly visited by Jeepers and dirt bikers, but future plans include a rock-climbing area and mountain bike trails. Access is free, but to cover expenses, the partners have held competitive four-wheeling events and a blues festival on the land. Parriott says they’re doing this "definitely for love" — the project cost them more than $30,000 last year — and they’d be happy just to break even. 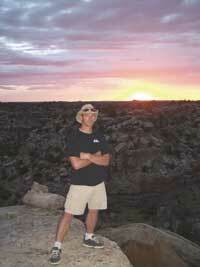 Adrien Taylor, editor of the Moab Times-Independent, says, "(Parriott’s) on to something. ... (Area BFE) gives people a place to really test their machines and skills. They’re going to do it whether we provide a place for them to do it or not." Neighbors have complained that the property isn’t zoned for public events and that Parriott and his partners haven’t gotten permits. "Our bubble’s been burst. To be next to that kind of development, it’s not what we wanted out here," says Kiley Miller, co-owner of an adjoining parcel. But Bruce Bunker, zoning administrator for San Juan County, says the partners haven’t broken any rules. Parriott gazes out over the desert again, and says he wishes a big transmission line some miles to the east was not visible. Then he shakes his head and laughs. "Listen to me. I don’t want power lines over there, but here I’ve bulldozed a parking lot." He adds, "I hope we’re allowed the time to make something happen here. I’d rather have people look at this as a way to work together."